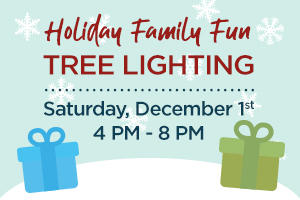 Don’t miss the fun and bring the family to the Menifee Christmas Tree Lighting on December 1st from 4 p.m. to 8 p.m. at the Mt. San Jacinto Menifee campus. There will be live entertainment, musical performances, an elves crafts workshop, plus free photos with Santa. Enjoy food and dessert vendors, a holiday bazaar, and a kid’s zone with 40 tons of snow! Don’t miss the chance to give back, and bring an unwrapped gift or non-perishable food item for the community cupboard. 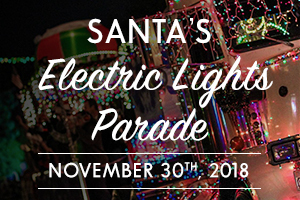 If you love the holidays, do not miss a fun-filled evening on Friday, November 30th, when Temecula celebrates its 26th annual Santa’s Electric Light Parade in Old Town from 7 p.m. to 10 p.m. Bundle up in your favorite sweater, enjoy some hot cocoa and show your #commUNITYpride. Everyone in the family can enjoy the twinkling lights from festive floats and holiday music from school marching bands as the crowd eagerly awaits Santa’s arrival. Support a great cause this holiday season. 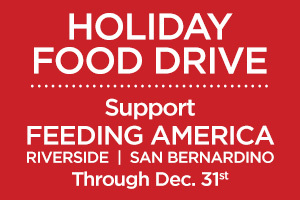 Now through December 31st, Audie Murphy Ranch is hosting a Holiday Food Drive that supports Feeding America, an organization that helps feed hungry families throughout the Inland Empire. In an effort to #GiveHealthy, you will have the opportunity to donate fresh fruits, fresh vegetables and other healthy food items. Hunger is a growing problem in America and this holiday season we want to feed families in need. Donate online at TinyURL.com/AMRFoodDrive.